I was a bit worried that I might fall into “3 strikes and you are out” category! Afterall, I have been lucky to have three of my recipes already published in Fitness Magazine (September 2010 Curried Shrimp with Mango Couscous, November 2010 Chicken Soba Bowl, and April 2011 Lemon Thyme Chicken). Boy, was I happy to get an email from Fitness asking me to develop another recipe. 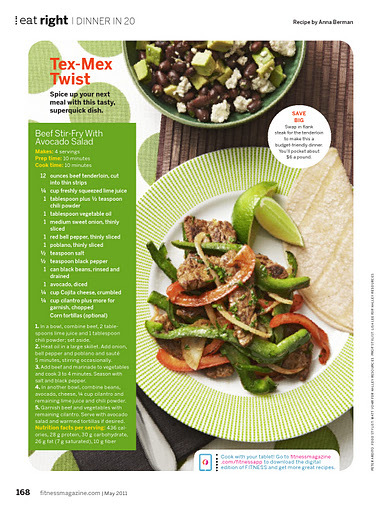 This time, I reached down to my Texas roots and came up with with this recipe for Tex-Mex Beef Stir Fry with Avocado Salad. Will you give it a try? I love developing this healthy and delicious recipe that takes 20 minutes to make – no more excuses for not having enough time. Feed your body, feed your soul – you are worth it! Go get your copy on the newsstand. Page 168, May 2011, Fitness Magazine. I would love for you to try out the recipe and get your feedback! I hope you enjoy it.